What is a Thai train trip without the alcohol? You are not allowed to sell or consume alcohol on trains in Thailand. This rule change came in July 2014 and the authorities mean business. You can’t buy a beer in the restaurant car any more and the guards or police get very upset if they catch you drinking. The reason for this rule? Well, sadly in 2013 a young man working as a subcontractor for Thai railways cleaning the carriages and making the beds raped and murdered a 13 year old Thai girl in a sleeper carriage. The young man in question was high on smoking meta amphetamine (‘ice’ or ‘meth’ as it sometimes known) and had also drunk some alcohol. Reaction of the State Railway of Thailand? Did they ban the staff from drinking and introduce background checks on subcontractors, mandatory drug testing, or better supervision or training of staff? Hell no. They banned the customers (and the staff) from drinking. Nice. Punish the customers for actions of the staff. Makes perfect sense if you look at it from a really strange perspective. Anyhow, at this point you must me thinking that I have a drinking problem. A few hours without alcohol is no problem except for people without a drink problem. You would of course be partly right, but you would have entirely missed the point. Pour yourself a drink and let me explain. Train travel in Thailand is slow and at times a little uncomfortable. If you take the train some distance, ie Bangkok to Surat Thani or Bangkok to Chiang Mai, you can expect the train to arrive anyway between 1 and 3 hours late. It can be difficult to sleep even on a sleeper train. The other customers or staff can be noisy. The air-con is either too cold or not working. The staff often pester you to buy some pretty awful overpriced food and then not give you your change, or charge you double the price for coffee in the morning (pay only 20 THB that is the real price). All these things aside I love travelling on Thai trains, but I loved it more when you could drink. Before 2014 it used to be great fun. Before about 2005 it was really great fun. The first time I travelled on a Thai train was in 2004. The trip down to Koh Samui by Bangkok Airways simply got too expensive so I decided to take a train. Best travel decision I ever took in Thailand. As soon as I got on the train everyone cracked open the bottles. Travellers talked to each other. A group of us moved into the passage between the carriages, opened the door, drank whiskey and smoked cigarettes. I thought we were in trouble when the police (who are present on every train in Thailand) came along but as it turned out they only wanted to sit and have a drink with us. 03.00 and drunk as a skunk I crawled back to my bunk. What a great night and considerable more fun than taking an expensive flight or a bus. Use the Search Form below to buy your Thailand Train Tickets online in advance. 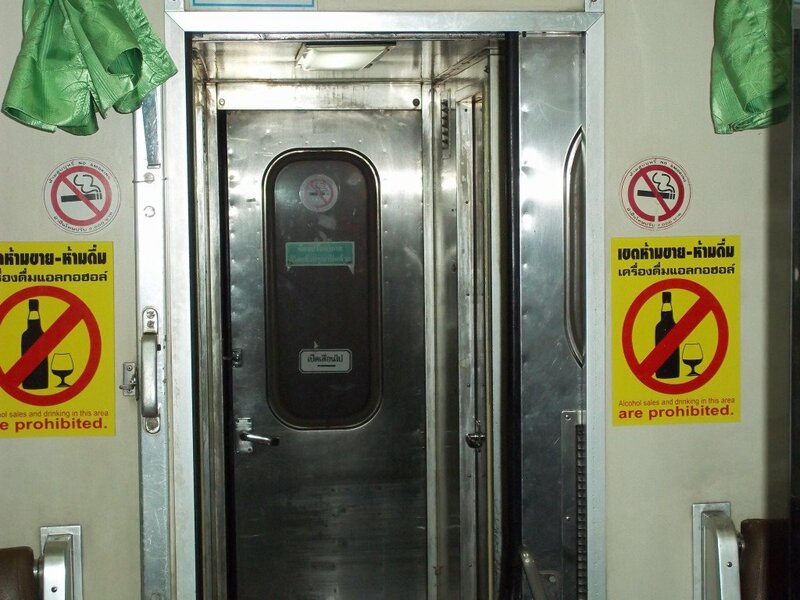 Move forward to around 2008 to 2009 and the Thai authorities had started to crack down a bit on people actually drinking in the carriages. I think what happened was that more main stream tourists starting using the train as Thailand became an increasingly popular destination for two week holidays and they got complaints about the traditional backpacker crowd keeping them awake. The party moved to the buffet car. The buffet car on a Thai train used to turn into a small disco with bad seats and worse music about 20.30 every night. Very slutty looking waitresses used to turn the lights down and crank up the stereo, replete with speakers with alternately flashing red, green and yellow lights. Thai men and a variety of Western tourists (of the more old school variety) used to seat mixed up together crammed into the small amount of available seating. Beer and spirits were a bit expensive, the food awful, but the atmosphere was great. You could drink cold beer, smoke out open windows and watch the Thai countryside speed past (well actually meander because the train go slow most of the time) and contemplate life. Now if you want to booze on a Thai train you need to do it covertly. Spirits are the thing to bring, as well as a book. Banning drinking on Thai trains has not stopped the drinking but it has created more lonely alcoholics. Except of course for the staff who all booze together covertly in the buffet car in the evening. That pink tinted liquid they are drinking out of the ice buckets is not grenadine.